The advanced Surge Protector is perfect for the home office or professional workstation. Voltage fluctuations, surges, and spikes can damage your computer and peripherals and degrade overall performance. 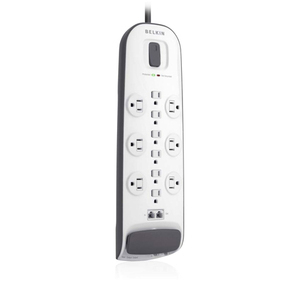 Belkin's advanced Surge Protector safeguards your personal computer, printer, hard drives, modems, and other hard-to-replace equipment against damage, data loss, file corruption, and system crashes.